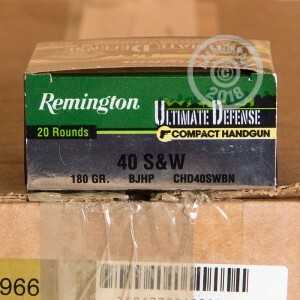 Remington's Ultimate Defense Compact Handgun series of jacketed hollow points is designed to improve the performance of popular concealed-carry firearms. 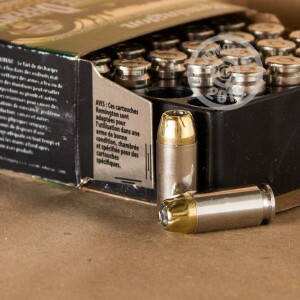 The 180 grain jacketed hollow point bullet in this .40 S&W load uses a brass jacket to provide enhanced penetration, shoring up a major weakness of shorter-barreled pistols caused by lower muzzle velocities. This helps increase the chances that the bullet will actually incapacitate an attacker when it expands instead of merely causing a flesh wound. These rounds use non-corrosive Boxer primers and nickel-plated brass cases for maximum durability. Each box contains 20 cartridges. 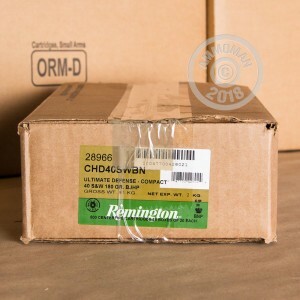 Buy a few boxes or stock up on ammo for multiple firearms at once at AmmoMan.com. If you spend more than $99 in a single order, the whole order ships for free!